So it wasn't quite the 'Super Saturday' that we hoped for at the Olympic Stadium. More like a 'Scrappy Saturday'. England were unable to beat New Zealand and wrap up a first series win since 2007. That's the bad news. The good news? We're all set for a humdinger of a decider next Saturday, 13:00 GMT sharp. See you then! England can take a lot away in relation to their defence but the Kiwi offload game has been the difference. New Zealand have improved beyond all recognition but I think England also have some improvement in them. Next week will be who can attack the best. There isn't much between the teams and that is Test match football at the highest level - maybe just the bounce of a ball. Nathan Burnett: I think we got a bit predictable in just trying to storm up the middle let's throw it around give it some width a few offloads too. Steve: Two great defences on show but the Kiwis' kicking game second half made the difference.England half backs very poor, no creativity, no ideas. New Zealand centre Dean Whare: "It was a must-win game for us, they got us in the first game, we had to give everything tonight or we knew we would be going home as losers. Credit to all the boys. "Last week was a learning process for us. They blew us through the middle, had quick play the ball, it was very different to the NRL. But they couldn't do that this week. "We can play better 100% next week, we'll up our game. If we get our combinations and execution right." I've yet to meet anybody who did not think that New Zealand did not deserve to win here in London and level the series. I've also to meet anyone who thought that was a particularly memorable game, at least from an attacking perspective. Next week's game in Wigan is already sold out - and expectations will be high that the match will deliver a lot more than we saw at the Olympic Stadium today. New Zealand try-scorer Shaun Kenny-Dowall: "England have got the capability to move the ball, they came through middle today. It will be interesting to see what they do in the third Test. But if they move the ball out then we will be ready for them." Martin Malloy: Just because it was low scoring doesn't make it less spectacular great defence is a speciality. Joshua: Definitely think George Williams needs to be dropped, was lost today. Stuart Lake: You're not mentioning Luke Gale. He would have won that game for us today. Williams was clueless. I think the key statistic here is possession. Usually with that amount of possession you would win by three or four scores. That shows the excellent level of defence by England. England defended well, but not quite well enough. And they were short of ideas going forward. Not a great combo. Not only did New Zealand edge the scoreline, they also edged possession (55%) and territory (57%). And they put together 14 repeat sets. Phil Halliwell: A flat display by England. great defence. but England need to use the centres and wingers much more. John O'Connor: One word: Sluggish. No use going hell for leather next week instead -should have wrapped it up. John Kelly: England are a better team than for along time, management and tactics letting down. England coach Steve McNamara: "It was a really tough game. We defended brilliantly most of that game, it was one soft try, but there was nothing between the sides. "We just did too much defending which took too much juice out of ourselves. We didn't have energy to do anything with the ball. "They are a terrific team, but we gave them a start with some of our mistakes at the start of their sets. We've got to get out there next week and win the series." 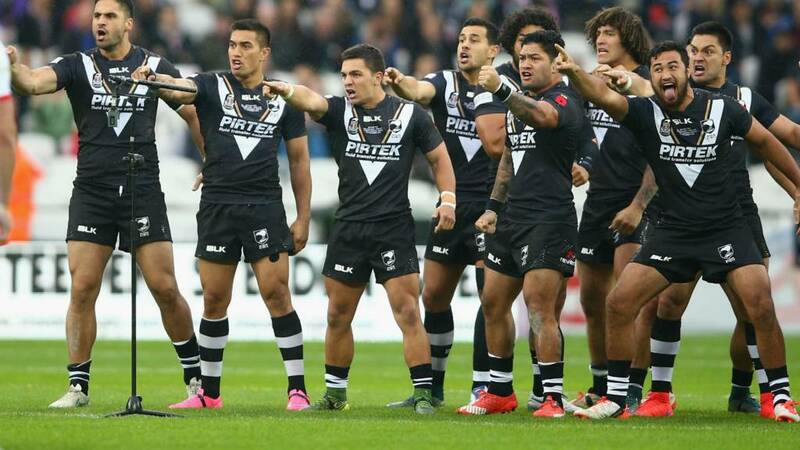 New Zealand coach Stephen Kearney: "I'm Immensely proud of the effort. It was a good old-fashioned Test match. We had a hard look at ourselves earlier in the week and they responded magnificently. "Last week we lacked a bit of attitude but today we had attitude. We didn't execute quite how we would have liked but that is testament to England and how they defended. "I'm pretty sure that's not going to be good enough next weekend though so we'll look to improve again." England captain Sean O'Loughlin: "It was a tough game and those sort of games can go both ways. That's what you expect in an international match. We didn't handle it as well as we did last week, but credit to them. Now we have got some work to do before next weekend's decider." Our television colleagues have disappeared from BBC One - but don't fear! Mark Chapman and the crew are now over on Red Button, gleaning all the post-match reaction from the Olympic Stadium. Head over there now. New Zealand co-captain Adam Blair: "All week we worked on our defence. We just played for 80 minutes. We had to be patient and kept building pressure. "We will go back to the drawing board and we can win the series next week." England, one. New Zealand, one. Honours are even after two of the three-Test series, setting up a thronker of a decider in Wigan next week. The hooter cranks into life and that means it is game over. New Zealand victorious, England beaten. Both sets of players drained. England gamely go on the attack, trying to salvage some pride if not the game. But another handling error, this time from Josh Hodgson, stunts their progress. Kiwi head and feed. Kiwi celebrations. They know it is job done. We haven't seen the end-to-end classic we had hoped for but take your hats off to both defences for their performances here. That drop-goal was Jordan Tahu was almost the starting gun for large sections of the crowd. Most had stuck around hopeful of a late England try but when Tahu took his team's lead to nine point, many were happy to head for the exits. England know they have got to get to the other end of the field. Quickly. The home side try to run the ball, but are running into dark alleys. You have two opportunities there which should have been scored - one for each side. England have been given a reprieve but they have to step up. Loudest cheer of the day? Isaac Luke missing that penalty. Or at least until Graham went over. Then it turned to boos as the video ref delayed and delayed his decision. That was the right decision by the referee. There was a comedy of errors out there. Sorry England fans - your team is not back in this game. James Graham did not ground the ball according to the video referee. And you have to say that, despite the howls of derision from the London crowd, is the right decision. That missed kick by Isaac Luke could be a gamechanger - England are back in this! Well, potentially. Quick-thinking from Josh Hodgson, whose neat grubber kick from five metres out slices apart the Kiwi defence. James Graham dives on the ball - but is it clean? At this level that is a bad miss. It should have been an easy kick for someone like Issac Luke and will give England the incentive. Great chance for New Zealand to sign, seal and deliver the victory. England punished for not releasing in the tackle, simple chance for Isaac Luke in a central position. Oh my! He's missed. Luke's slides his kick wide right of the posts. England breathe a sigh of relief. Game changer? And, following Paul Fletcher's assessment about errors creeping in, England produce another horror show right on cue. A sloppy pass from George Williams at dummy half leaves Ryan Hall stooping low to grasp the ball. He knocks on inside his own half in a central position. Plenty of late afternoon sunshine now, plenty of tension too. Errors are starting to creep into this game and one could prove decisive. Lots of hands on hips by the watching players and staff on the England bench. The Kiwis have not tired as they did last week. Inspiration required. As the sun sets over the Olympic Stadium, is the sun setting on England's hopes of winning the series today? Time is running out and they don't really look like carving a hole in the Kiwi defence. Josh Hodgson is back on at dummy half, his quick-thinking getting England moving down the right. But Elliott Whitehead cheaply gifts possession back to the Kiwis, trying to offload when the offload wasn't really on. England have got to hang on now. Adam Blair is becoming more influential and the Kiwi kicking game has improved greatly. Momentum will switch back to England and they are not out of it yet. Nope, Peta Hiku does not ground the ball properly. Largely thanks to the attentions of England second rower Brett Ferres, who wraps himself around the Kiwi scrum-half. Top defending. England, like they were before the break, are hanging on for dear life. A cheeky, no, nonchalant offload from Adam Blair in front of the posts finds Peta Hiku, who kicks for the line. But England full-back Zak Hardaker is alert to kick out. The crowd are absolutely desperate for England to do something to inspire them. The break by Kallum Watkins swiftly had the crowd on their feet. Cries of 'Come on England' have largely been born of frustration. Composure will be key from now on, with the next score absolutely vital. Kicking has been patchy so far today. England then go left, but also find their road to the line blocked. New Zealand pick up a loose ball, turning defence into attack in the blink of an eye. Isaac Luke goes into the top drawer to pluck out a kick, pinning England back with his boot and forcing the in-goal kick. England's pack pound through the middle, trying to tire out the Kiwis. Then they make their move. Gareth Widdop, the orchestrator, directs his team out wide right, but Kallum Watkins cuts inside. Right into a wall of Kiwi defenders. The Leeds centre offloads, but neither Joe Burgess or Zak Hardaker can finish off the opportunity. Chance gone. It is so tense out there - England need to shift the ball wide. It is coming for them. Set to you. Set to me. England and New Zealand trade sets, Joe Burgess leaping like a salmon to pluck a hanging kick out of the gloomy London sky. Still nervy, still tense, still on a knifedge. Off. The. Hook. England don't have to dig as deep into their energy reserves as they feared. Kiwi scrum-half Kodi Nikorima's brain is not on the same page as his body, his mind already thinking about where he can jink through the 'Wall of White'. But he fails to grasp the ball and it spills onto the grass. I think England have a chance to move the Kiwis another way in this second half by trying to move laterally with Hardaker and Watkins before going forward. All gone a little bit nervy inside the Olympic Stadium. Gareth Widdop goes with a high bomb as England go through another set, team-mate Ryan Hall - one of the best jumpers in the game - trying to pat down to a white shirt. But the Kiwis show neat handling skills themselves to keep hold of the ball. England look they are trying to target the right-hand side of the Kiwi defence but they haven't executed properly yet. Instant chance for England to hit back. Some greasy New Zealand hands knock on, England hopefully scamper forward. But the home side turn down a certain two points after being awarded a penalty in front of the posts. They go through five tackles before Gareth Widdop knocks on as the hosts go searching for the try line down the left wing. Chance gone. Tohu Harris missed out on the 2013 World Cup when Sonny Bill Williams changed his mind and decided to play. Harris suddenly found himself not wanted. Harris scored the Kiwis opening try in Hull last week and his brilliant hands unlocked the England defence just now. It has all gone very quiet. That is great skills by Harris. There was nothing on for the Kiwis, they didn't go for the kick, kept the ball alive and it was superb skills by Kenny-Dowall to finish. Soft start to the second half from England. The Kiwis are allowed to play the ball quickly in the home 22, an offload in the tackle scooped off the floor by Tohu Harris. Skills! The Kiwi second-rower slips the pass out to winger Shaun Kenny-Dowall - nothing wrong with that. Easy touch down in the corner and an easy decision for the video referee. Sloppy start from England after they ran the ball back into the Kiwi half. Forward pass from Tom Burgess hands over possession at the scrum. New Zealand's strength is their offload game and England need to be aware of that. It will be an off the cuff offload which will help them break the England line. Matt Blades: If Shaun Johnson was playing for #NZ, I think they'd be able to have the high kicks flowing but they don't have a replacement for him. Jonathan Horlock: Lack of creativity for England in the first half, badly missing Sam Tomkins. Matt O'Connor: For me, England's stand out players so far have been Graham, Burgess and Bateman. The kicking game from New Zealand has been shambolic at times and substandard for the international game. England's wasn't great either but for the Kiwis there was no clear vision to the kicking. By the way, our pundit Jon Wilkin is sporting one of the great moustaches. Presenter Mark Chapman reckons he looks like Tom Selleck (younger readers - ask your mum or dad). I'm going for a more contemporary reference - he looks like he should be on the set of Anchorman. Stay classy Jon. I thought Kallum Watkins came up with some good defence showing his athletic ability in that half but overall, England have shown a willingness to stick together with their goal-line defence and the young Kiwi halves haven't been able to create space. Interesting insight into the two dressing rooms at the break. England's players are all sat on the wooden benches, in a horseshoe around coach Steve McNamara, who is delivering his thoughts school-assembly style. Down the corridor, Kiwi boss Stephen Kearney doesn't appear to be doing much talking. He is stood in the corner, arms folded, observing his senior players leading the chat. You have to commend both sides for their goal-line defence in the first half but it has been a bit of drab affair in terms of attacking flair. This crowd might not entirely comprise die-hard rugby league fans but they have definitely appreciated England's brilliant defence. Time and again in the opening half England had to remain strong to hold out their opponents and the crowd responded in turn. However, this arguably isn't proving to be the ideal match to win over the neutrals. After all, how often do you have a half of league without a try? It has been a very physical encounter. The speed of the game changed when Roby and Tom Burgess came on and New Zealand need to deal with that in the second half. A battle of attrition? Or a drab encounter? Probably a bit of both to be fair. England will be the happiest I'd imagine, defending heroically, despite lacking much attacking guile. England will take great confidence from that first-half display. The Kiwis have thrown everything at them offensively and they have held firm. The Kiwis throw everything at the England line again, keen to ensure this match isn't try-less at the break. But a grubber on the last is swept up by England winger Joe Burgess behind his posts, and he scrambles the ball out of his in-goal line to avert the danger. And that is virtually the last action of the first half as the hooter sounds. The pendulum is swinging back towards the Kiwis. The world's number one side look almost certain to bag the game's first try, Kevin Proctor scurrying down the right side before England's defence haul them back. The Kiwis threaten down the left a couple of tackles later, but Jordan Kahu finds his path blocked. Then a strange kick from Isaac Luke into the in-goal area almost cleans out the referee before going out. England are doing now what the Kiwis did earlier. The visitors have to drop out, as England run the ball back at them. But the home side let the Kiwis off the hook, a forward pass handing them a scrum and easing the pressure. England look far more cohesive as a unit than New Zealand. They just need to show a bit of composure. Gareth Widdop is controlling the kicking game well. However...there is a Kiwi knock-on in the build-up. Another England set...another grubber from Widdop into the in-goal area. This time Kiwi full-back Roger Tuivasa-Sheck needs to be alert to cuff into touch. Great chance for England. Tom Burgess pounds the line again, before Widdop goes left. Ryan Hall is lurking but can't convert, offloading as Widdop's grubber is chased by Sean O'Loughlin. But Tohu Harris is there to sweep up. England are finding their groove now, completing their sets nicely and asking questions of the Kiwi defence. Tom Burgess has made a positive impact, bashing holes in the away defensive line. England, having survived that pounding, go on the attack. What a sucker punch this would be for the Kiwis if the home side can nab something. But they can't. George Williams is another page with his kick on the last, none of his team-mates chasing. England's replacements had to wait patiently as their team-mates survived that Kiwi onslaught. Now Tom Burgess and Brett Ferres are on to ease the pressure on the pack. England have made over 50 tackles, more than double that of those made by the Kiwis, who have enjoyed 61% of possession so far. Last week's game was officiated by Super League referee Ben Thaler. There were nine penalties in total in a fairly scrappy game. Australian Gerard Sutton is in charge today. He has brought his whistle a long way and he is going to use it. We had six penalties in the opening 20 minutes. No messing around at all at the ruck. Interestingly, four against the Kiwis. A big, big cheer for Tom Burgess, who has just come on. That was a massive defensive effort by England. The Kiwis were bashing at the door via route one but the Wall of White held firm. The England line is being hammered. Successive sets again for the Kiwis, with powerful second-rower Tohu Harris leading the charge. The visitors are going route one - crash, bang, wallop. Our screens might need Batman-style subtitles. The second consecutive set turns into a third as England cannot get hold of possession. New Zealand go out wide to the left as they try to pick England apart, only for Peta Hiku to spill the ball about five metres out. Phew! England make a change at dummy-half, James Roby on for Josh Hodgson. The St Helens man's first job? Defend. At some stage you will get the ball back from these Kiwis. England need to stay patient and play the numbers. Both defences are definitely more up to speed than they were last week at Hull. Uh oh. Here's trouble. The Kiwis earn back-to-back sets as the ball bobbles off an England body and back into away hands inside the home half. England need another big defensive effort - and that's what they get. Trojan-like defending. Good set from England as they try to pin back the Kiwis, and lift the Olympic Stadium crowd. The atmosphere picks up as the home side move into the Kiwi 22, but Gareth Widdop's grubber on the sixth is overcooked and dribbles into touch behind the posts. New Zealand are dangerous with their offloads but there is no real pattern emerging yet. In territory, New Zealand have the edge, but the discipline could prove crucial today. Not what I would describe as a deafening noise emanating down from the stands. The atmosphere wasn't exactly buzzing at the start last week either. England need to lift and impress this expectant crowd, many of whom might be new to the game. More a case of polite applause so far. England are penalised for holding down, like the Kiwis were earlier. And the end result is the same. A simple penalty knocked over the sticks, Isaac Luke is the man who hauls the Kiwis level. Kiwi wing Jason Nightingale comes in-field to start an away attack, England are penalised as the Kiwis are given encouragement. Peta Hiku's nifty footwork 10 short of the try-line is read by the English, as is Tuivasa-Sheck's down the right. The Kiwis go back to the left, looking to find Jason Nightingale on the touchline. But Joe Burgess sticks his right hand on the ball, palming into touch to stop an almost certain try. The referee Gerard Sutton wants to keep the ruck clean and I think that will be the big difference to last week as he tries to speed it up. A few sighs of frustration around the Olympic Stadium as England go for the conservative approach. But it has got the scoreboard ticking, Gareth Widdop confidently booting over the two points. It's all about the start for the English - they started poorly last week. I think the Kiwis will make it physical for them. Decent crowd, cracking atmosphere, superb Haka, impeccable observation of a minute's silence, dry at last. Decent first set from Kiwis, kicking long on the fifth to England full-back Zak Hardaker. The home side come back, with skipper Sean O'Loughlin skipping through a couple of tackles. Gareth Widdop pumps a kick high on the last, which is gamely chased by team-mate Elliott Whitehead. The second-rower palms the ball back, Kallum Watkins kicking the ball left. Still England's ball, John Bateman tries his best footballing skills, only to boot into touch. England half-back Gareth Widdop is the man charged with getting the action under way. And that's what he does, kicking long to force the Kiwis to run back from deep. Last week in the second half New Zealand didn't show enough urgency. They didn't have enough options in attack which allowed England to press and force the errors. England were very disciplined, didn't give away any errors and had better game management. Moment of reflection for the Olympic Stadium as a minute's silence is held to remember Armistice Day and Chris Leatherbarrow, the 27-year-old rugby league referee who died last week. New Zealand need to retain the ball and make sure they slow the ruck down because England have a very quick play-the-ball. Smoke? Check. Fireworks? Check. Loud rock music pumping out of the PA system? Check. All the vital ingredients for the razzmatazz of an important international game are there. As indeed, most importantly, are the two sets of players. England skipper Sean O'Loughlin is wearing his game face as he leads his side out of the tunnel. Kick return, kick return, kick return - New Zealand full-back Roger Tuivasa-Sheck was practicing one after another earlier, high bombs, grubbers, hanging kicks, flat ones - the lot. The 22-year-old broke the metres record in the NRL last season - in fact he smashed it to pieces, running an astonishing 5,767 metres. England kept him relatively quiet last week, they were shrewd with their kicks and very watchful. Can the Kiwis get him into the game more this week? Only five minutes to go. We are offered a quick glimpse inside both changing rooms, the England players are pacing around the floor a bit like you or I would just going in for an important job interview. A few nerves aren't a bad thing, are they? The scene inside the Kiwi dressing room is a little more relaxed. Everyone is sat down, swigging some pre-match electrolytes. Daley Thompson is a man who knows a thing or two about producing top form in an Olympic stadium. So who better than Britain's most decorated decathlete - arguably Britain's greatest athlete full stop - to hand out the England team jerseys? That's exactly what he did yesterday, dishing out the shirts to the players and offering a few words of wisdom. New Zealand have got a big challenge today. All of the big men have a job to do to try to stop the likes of James Graham and Chris Hill. New Zealand coach Stephen Kearney had named the same thirteen which narrowly lost in Hull last week. But the Kiwis have made a late change, bringing Kodi Nikorima in for Tuimoala Lolohea at scrum-half. Kiwis: Roger Tuivasa-Sheck, Jason Nightingale, Jordan Kahu, Dean Whare, Shaun Kenny-Dowall; Peta Hiku, Kodi Nikorima; Jesse Bromwich, Issac Luke, Sam Moa, Kevin Proctor, Tohu Harris, Adam Blair. Straight forward from an England perspective. Same starting XIII from last week's 26-12 win in Hull. And the same bench. England: Zak Hardaker, Joe Burgess, John Bateman, Kallum Watkins, Ryan Hall, Gareth Widdop, George Williams, James Graham, Josh Hodgson, Chris Hill, Elliott Whitehead, Liam Farrell, Sean O'Loughlin (captain). Replacements: James Roby, Thomas Burgess, Mike Cooper, Brett Ferres. Hopefully you're feeling pumped and patriotic ahead of England chasing their first series win since 2007. But before you start dabbing a St George's Cross on to your face and dashing to the nearest novelty shop for a medieval knight's outfit, let's just pause for a moment. Sure, England managed to see off New Zealand in last week's first Test. And sure, the Kiwis are missing a few key players. But these lads are still no mugs. Roger Tuivasa-Sheck? Check. Isaac Luke? Check. Jesse Bromwich. Check. I think Sam's return is great for the game and with his brother George to come back into the reckoning next year as well after injury, I am really excited about the Four Nations next year and our prospects in the World Cup the year after. The Olympic Stadium is filling up very nicely with about 20 minutes until lift-off. The England players have been limbering up for a short while, prop Chris Hill clapping those punters already in their seats. You pick Sam to do a job. When I went to rugby league I knew my role. It looked like they didn't know what to do with him. All of the people who say he is a quitter don't know him. He is not a quitter. Sam Burgess's return is exciting for the game. He is a genuine superstar. He is back in a game which will allow him to show his talents. He needs to have the ball in his hand 20 times a game, not just three or four. Switch channels on the remote, turn up the volume on your wireless. Our television and radio coverage has started. On the box, former GB coach Brian Noble, cross-code international Jonathan Davies and ex-England skipper Jamie Peacock are all suited and booted. The trio, along with equally-dapper presenter Mark Chapman, are standing on the Olympic Stadium touchline with microphones in hand. It is Ryan's stag do. Ryan, of course, is on the left. How are we going to ensure that Ryan is the centre of attention? I know, let's dress him up as a cheerleader. Ryan is still looking a little sheepish. But will he have much excuse to work on his pom-pom skills this afternoon? Ground slowly starting to fill. The rain has stopped. The brass band is playing. Anyway, let us know. Tweet #bbcrl or text 81111. And, if you don't want to talk about Burgess, then still get in touch. Fancy England to get the job done today? Where will the key battles be? Let's hear you. Is Sam Burgess a scapegoat, a quitter, both - or neither? That's the question mulled over by my BBC Sport colleague Ben Dirs. "If Burgess had been handled with more care, his union career might have blossomed into something beautiful. He might have been another Sonny Bill Williams. He might even have been adored at Twickenham," he says. Read the rest of Ben's assessment, with input from Jonathan Davies, Iestyn Harris and Paul Sculthorpe, of the Burgess saga. It's well worth spending five minutes on. You might have heard the name 'Sam Burgess' mentioned one or two times this week. That's because (just in case you have been stranded on a desert island for the past couple of days) rugby league's favourite son has returned from the 'dark side'. Burgess has left rugby union Bath side to return to NRL side South Sydney Rabbitohs, sparking joy among league fans and leaving union as a "laughing stock" according to Sir Clive Woodward. Time for a bit of shameless plugging. As well as following these words, you can also watch the action on BBC One (and right here on this page) or listen to BBC Radio 5 live sports extra's coverage. Both programmes start at 14:00 GMT. Take your pick. It looks as though the Olympic Stadium has a magnetic pull, so keen have people been to head rapidly towards it. This might have something to do with the shelter it offers compared to the exposed Queen Elizabeth Olympic Park all around. It has been raining hard and it is windy - although mercifully the rain has relented (for now). However, the pitch is greasy and will undoubtedly test the handling skills of the players. Will this suit the Kiwis, with their strong and powerful pack? Or will England, with a more experienced half-back pairing, benefit from a cagey, less expansive up-your-jumper type of game? Come on London, give the game a break. The RFL has worked really hard to make a success of their fixture at the Olympic Stadium. Alas, persuading fans to leave the dry, warm, inviting coffee shops and bars in the shopping centre near the Olympic Stadium for the Fan Zone next to the ground has been a tough sell today. Not the RFL's fault. At the fan zone you can meet players, listen to music, kick and pass balls, eat, drink, just about anything. But you have to do it without shelter about your head. And where else is better to impress the entire nation then putting on a show at the jewel of its sporting crown? That's right, rugby league is rolling into London's Olympic Stadium for the first time. Steve McNamara's men are following in the footsteps of Team GB's London 2012 heroes Mo Farah, Jessica Ennis and Greg Rutherford, trying to create their own 'Super Saturday'. A win over New Zealand will give them an unassailable 2-0 lead in their three-Test showdown - and a first series win since 2007. If that happens we might even see Steve Mac running down the touchline doing the Mobot. Or maybe not. Rugby union seduced the nation as World Cup fever hit England. But the fans were let down by false hope and ineptitude. Rugby union also wooed the most-loved, most-cherished member of the rugby league gang. Sam Burgess, according to many onlookers, has been let down by false hope and mismanagement. Now rugby league is swooping in. A warming arm has already been slung around Burgess, and today England are hoping to capture the hearts of the nation. How? By beating the world's number one ranked side to earn a memorable series win. Pride has been damaged. Hope has been shoved out of the way by despair. Questions are being asked. Answers are being demanded. And rugby league is trying to take advantage.